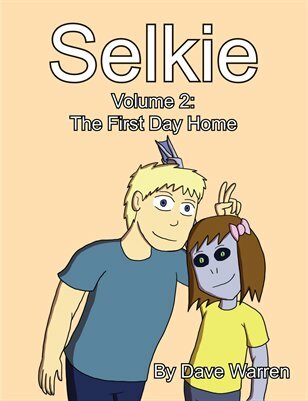 Welcome to the Selkie 2015 Hiatus, featuring several strips of Guest Comics and drawings! With many thanks to Isabelle, we’re kicking off with some Dad Jokes! Common now Selkie, you’re more than capable of making yourself a sandwich! But Selkie can’t eat bread! It’s made from plants! Meat sandwich! Two tuna steaks with layers of bacon between them? Sure. Kentucky Fried used to (I think it’s been discontinued) make something called a Double Down. Bacon and cheese in between two chicken breasts. I remember that it came with cheese as well. Perfectly for clogging those useless artires. Who needs a heart too began with? A slice of meatloaf between two slices of meatloaf? She can’t eat vegetables and I don’t think she can eat fruit, but I don’t know about grains. 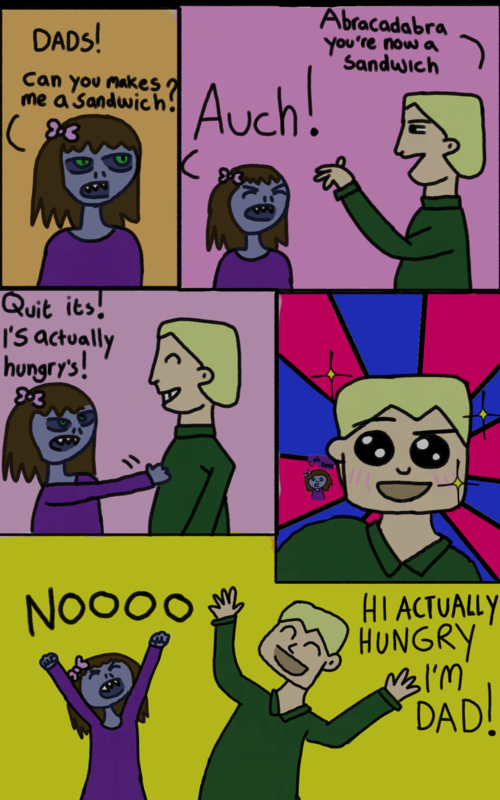 The worst jokes to pull on a hungry child. The worst thing to try with a very hungry kid. This is the single greatest comic I have ever seen. I must now someday become a dad, that I might pass these phrases on to my offspring. The best thing about being a dad: dad jokes. I don’t even!! Me Da’ was Just like that. All day Saturday and Sunday long. Interspersed with Tom Leher songs, or filk songs, pestered by puns, and 20 minute shaggy dog stories: “you wouldn’t send a knight out on a dog like this?” and worse. We uncles get into the act. My niece gets the joy of Weird Al, They Might Be Giants, and puns puns puns! whenever she’s around me. Aunts and older cousins have been known to get into the act around my family, as well. My parents introduced me to Tom Lehrer at a worryingly young age. Rather than puns, their preference was references (“Back in bowl! Back in bowl!” “Oh no, it’s K-K-K-Ken c-c-c-coming to k-k-k-kill me!” “Donde esta el bathroomo? You know, the roomo de batho?”) that I’m only now starting to get. I think it might be in Todd’s best interests to remember he is dealing with a hungry carnivore. And after those jokes, any reasonable jury would rule it self-defense. That’s gona be me when my kid starts talking. I’m already waiting on the edge of my seat for those setups to be able to let loose the worst jokes in the world. “Really Susan — what a nice name! Well, I’m glad you came to visit, Really. Come back again soon!” She howled in protest, but quickly changed and played along with the game. Ahhh dad jokes.. such a classic. Ahh dad jokes.. such a classic. Sorry Selkie but you walked right into that one. I really like the artwork here, especially they way Selkie looks. I HAVE INTERNAL 3RD DEGREE BURNS!